As of August 2010, pandemic H1N1 flu is no longer considered a pandemic. This fact sheet provides historical information about pandemic H1N1 flu and will no longer be updated. Pandemic H1N1 flu (originally called swine flu) is a respiratory infection. The pandemic H1N1 flu has spread to humans and has reached the level of a pandemic. A pandemic is a worldwide outbreak. 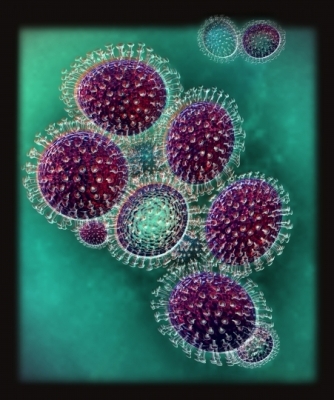 The pandemic H1N1 flu can cause mild-to-severe symptoms. If you think that you have this virus, call your doctor (or do as advised by local public health officials). There are 2 main types of influenza virus—type A and type B. This strain passes from human to human, so it may spread rapidly. By touching a contaminated surface and then touching your eyes, nose, or mouth. The virus can survive on surfaces and infect a person for 2-8 hours after being exposed to the surface. The main risk factor for getting the pandemic H1N1 flu is contact with an infected person. Having a chronic health condition (cardiovascular disease, respiratory disease, diabetes, cancer) may increase your risk of a more severe form of the infection. Also, people with physical or mental disabilities may be more at risk because they may not be able to easily communicate their symptoms or may have trouble practicing preventive measures against the pandemic H1N1 flu. People younger than 25 years old are more likely to be affected by the virus. The pandemic H1N1 flu is more likely to affect younger people than the elderly because older people may have developed immunity against the virus. Eating pork or pork products, and drinking tap water are not risk factors for getting the pandemic H1N1 flu. See your doctor if you notice your symptoms worsening or you do not begin to feel better 3 days after your symptoms first appear. If the pandemic H1N1 flu becomes severe, it can cause pneumonia . Deaths have occurred, but this has been rare. The pandemic H1N1 flu can also worsen medical conditions you may already have. Seek urgent medical care if you have emergency warning signs. The doctor will ask about your symptoms and medical history. Diagnosis of the flu is usually based on symptoms. Do not use products sold on the Internet claiming to treat the pandemic H1N1 flu. Talk to your doctor before using such products. Most people with the flu do not need antiviral medications. If you have the flu, check with your doctor to see if you need antiviral medication. You will need it if you are in a high-risk group or if you have a severe illness, such as breathing problems. Antiviral medications do not cure the flu. They may help relieve symptoms and shorten the time you are sick. They must be taken within 48 hours of the first symptoms. Oseltamivir (and perhaps zanamivir) may increase the risk of self-injury and confusion shortly after taking, especially in children. Children should be closely monitored for signs of unusual behavior. Some antiviral medications sometimes used to treat some kinds of seasonal flu do not work against the pandemic H1N1 flu. Note: Aspirin can cause serious complications in some children with certain infections. It is best to avoid aspirin or aspirin products for children with infections. Talk to your doctor about what is safe for you or your child to take. For example, cough and cold products can cause serious side effects in young children. Talk to a doctor or pharmacist if you are taking more than one drug. Some drugs can be dangerous when mixed. This includes over-the-counter medications and herb or dietary supplements. A pandemic H1N1 flu vaccine is available. The vaccine comes in 2 forms: a nasal spray and a shot. The nasal spray will be given in 2 doses (given one month apart) for children aged 2-9 years and in 1 dose for persons aged 10-49 years. The shot will be given in 2 doses (given one month apart) to children aged 6 months to 9 years old and in 1 dose for people aged 10 years and older. Make sure you talk to your healthcare provider about which vaccine is right for you. Wash your hands often, especially when you come in contact with someone who is sick. Wash your hands for 15-20 seconds with soap and water. Rubbing alcohol-based cleaners on your hands is also helpful. Avoid close contact with people who have respiratory infections. The flu can spread starting one day before and ending seven days after symptoms appear. Avoid crowded gatherings, especially if you are at high risk for complications from the pandemic H1N1 flu. Consider using a disposable face mask if you are at high risk and are unable to avoid crowded areas where at least one case of the pandemic H1N1 flu has been confirmed. Do not use products sold on the Internet claiming to prevent the pandemic H1N1 flu. Talk to your doctor before using such products. The Centers for Disease Control and Prevention (CDC) recommends that you or your child do not attend swine flu parties. To prevent areas from being contaminated, try to keep the person who is sick in one room of the house. Wash your hands after having contact with the person. If you cannot avoid close contact with the sick person, cover your mouth and nose with a face mask (or a N95 respirator if available). Limit contact with other members of the household or community while taking care of the person. The person who is sick should have little contact with others and stay home from school or work. You can go to school or work if you feel well, but remember to keep track of your health and take precautions (like washing your hands). If you develop symptoms of a flu-like illness, call your doctor (or do as advised by local public health officials) immediately. Ask your doctor if you should take preventive medication. Avoid close contact with people. Before you can return to school or work, your fever should be gone for at least 24 hours without the help of fever-reducing medication. This could take up to seven days after symptoms first appear. It is important to stay home if you have the flu, leaving your house only to see your doctor. Wash your hands often. Rubbing alcohol-based cleaners on your hands is also helpful. 2009 H1N1 flu. Centers for Disease Control and Prevention website. Available at: https://www.cdc.gov/h1n1flu. Accessed August 14, 2017. Influenza in adults. EBSCO DynaMed Plus website. Available at: http://www.dynamed.com/topics/dmp~AN~T435301/Influenza-in-adults . Updated September 27, 2016. Accessed August 14, 2017. Traveler's health. Centers for Disease Control and Prevention. Available at: https://wwwnc.cdc.gov/travel. Accessed August 14, 2017.